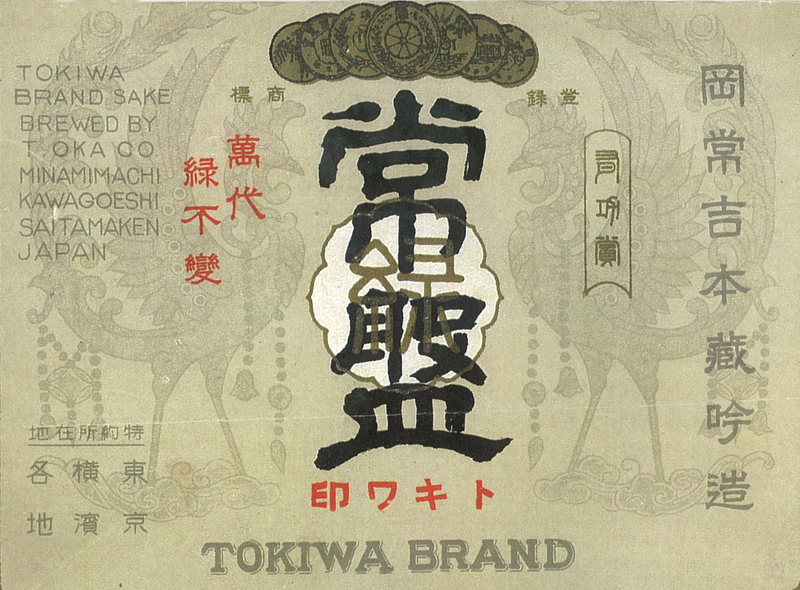 Tokiwa Masamune was the name of the family sake brewery in historic Kawagoe, Saitama Prefecture, Japan. 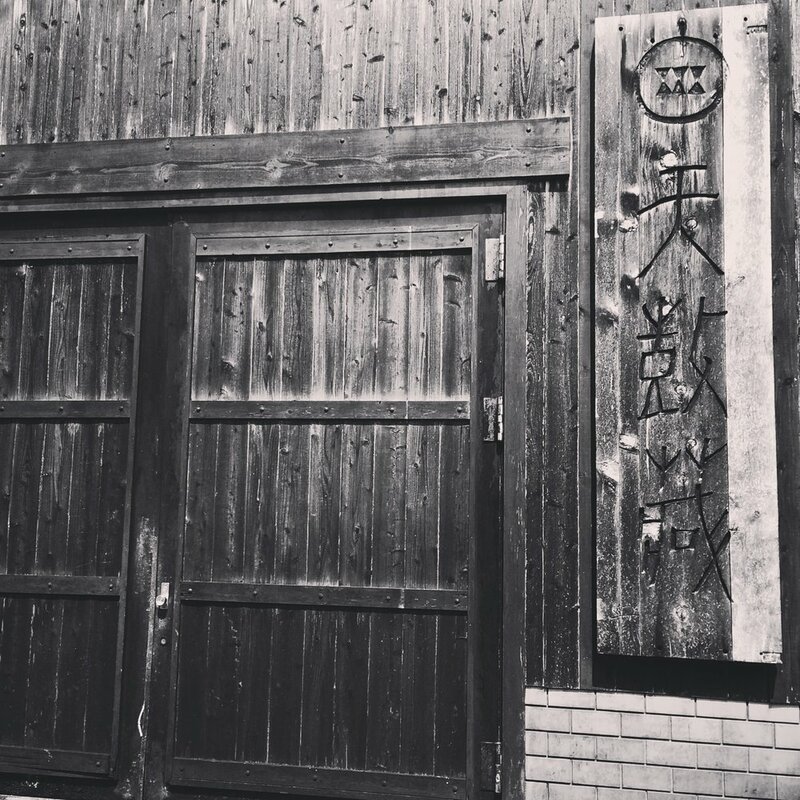 Yuno Hayashi's grandfather, who owned the brewery, had a deep love of good food and drink which he passed on to his granddaughter. It is his admiration for fine beverages that propelled Yuno onwards along her journey with whisky and sake. Legacy and Passion. These are the drivers that inspire Yuno’s pursuit of thought provoking Japanese beverages, and through Tokiwa Imports, she hopes to share them with you, the finest family owned whisky and sake from across Japan. Kanpai! Located just a distiller’s leap from Kobe Bay, Eigashima is the closest whisky distillery to the coast in Japan. 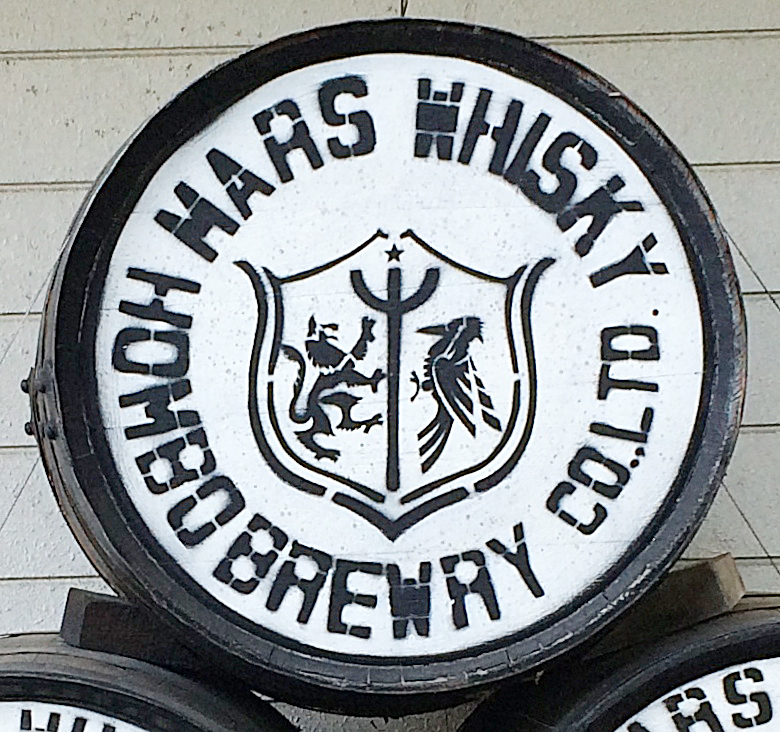 The ocean laden air is reflected in the whisky’s savoury, saline driven purity. Akashi is named after its hometown -- translated as the “Sun Rise City” -- where the owner’s family has been making traditional Japanese alcoholic beverages, like Nihonshu, for over three centuries. Founded in 1888, Eigashima holds Japan’s first whisky license, issued in 1919. serious malt production did not begin until 1984, when the current copper pot stills were put into action and a focus on premium whiskies began at their “White Oak” facility. Following a program dedicated to crafting an insanely fine, super sipping whisky, they limit production to insure that quality is preeminent, making Eigashima’s Akashi one of the rarest whiskies on the planet. Treat yourself to a bottle today. This is whisky blended in the scotch tradition, with Japanese precision, the malt is lightly peated, and vatting is mostly ex-bourbon, balanced by White Oak’s unique variety of barrels. TASTING NOTES: The nose is very fruity with apricots and dried fruits, and a shy note of honey. It all started some three centuries ago when the first of Ichiro Akuto’s forefathers began making alcoholic beverages in Saitama Prefecture. His Grandfather began making whisky in the mid 1940’s with Hanyu Distillery, whose focus on malt whiskies took off with the Japanese economic boom of the 1980’s. However, when the bubble burst in the 1990’s, so too did the first Japanese Whisky boom, leading to Hanyu, like several other distillers, shuttering their doors. He saved the old inventory of Hanyu and released the playing card series. A slow start in the early 2000s now unicorn whisky, the stuff of legend. With the success of the playing cards Ichiro saw that the revival was imminent and in 2008 he built his current distillery in Chichubu. Chichubu distillery where Ichiro, a 21st century whisky maker embraces the heritage and heart of the Scotts balanced by the precision of the Japanese and the shokunin philosophy. Distilled from barley floor malted by Akuto and his teams near annual trips to England Learning and constantly improving upon the art of floor-malting, aged 3-6 years in bourbon barrels. Bottle in January 2106. In Ichiro’s words “An all world whisky” the key malt is Ichiro’s Malt, with his selection of Scotch, Irish, Canadian and American Whiskey aged in country 3-5 years and aged on sight in Chichibu an additional 1-3 years. 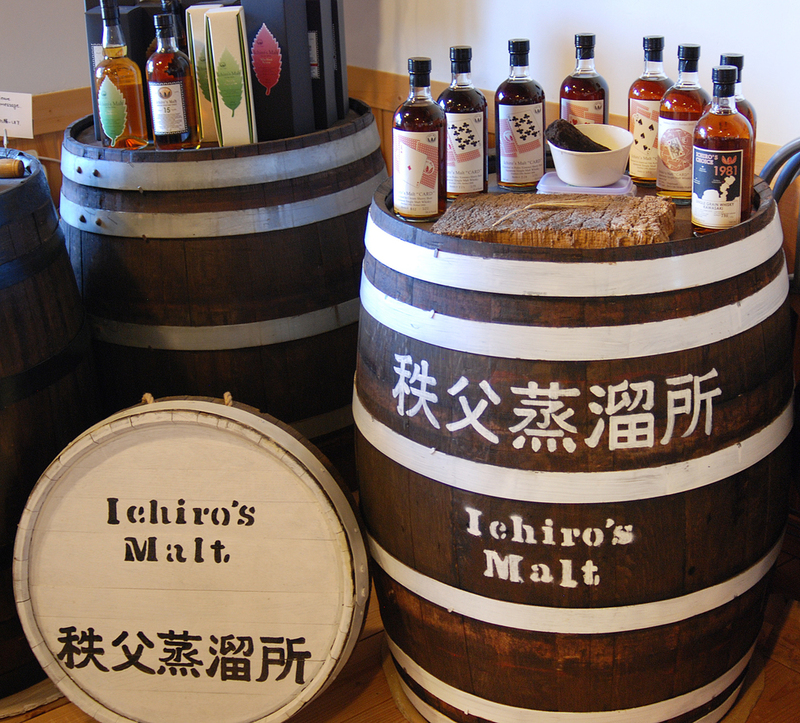 Ichiro’s Malt and Grain is blended to balance a heart of Japanese whisky complimented by the major whiskies of the world. Thanks to images of Tokyo, Osaka and Kobe, Japan is often thought of as an urbanus landscape filled with sky scraping metropolises evoking thoughts of Blade Runner. However, its mountainous topography makes it rather rural, with plenty of countryside in which to hide quaint, remote places. Once such space in the high hills of Hyogo Prefecture houses Nishiyama Shuzo, home to Kotsuzumi Saké. Established some 168 years ago, 1849 to be precise, Nishiyama is a classically modern Shuzo, respecting its history, whilst forging ahead in that unique way the Japanese have of blending tradition with modernity to achieve perfection. 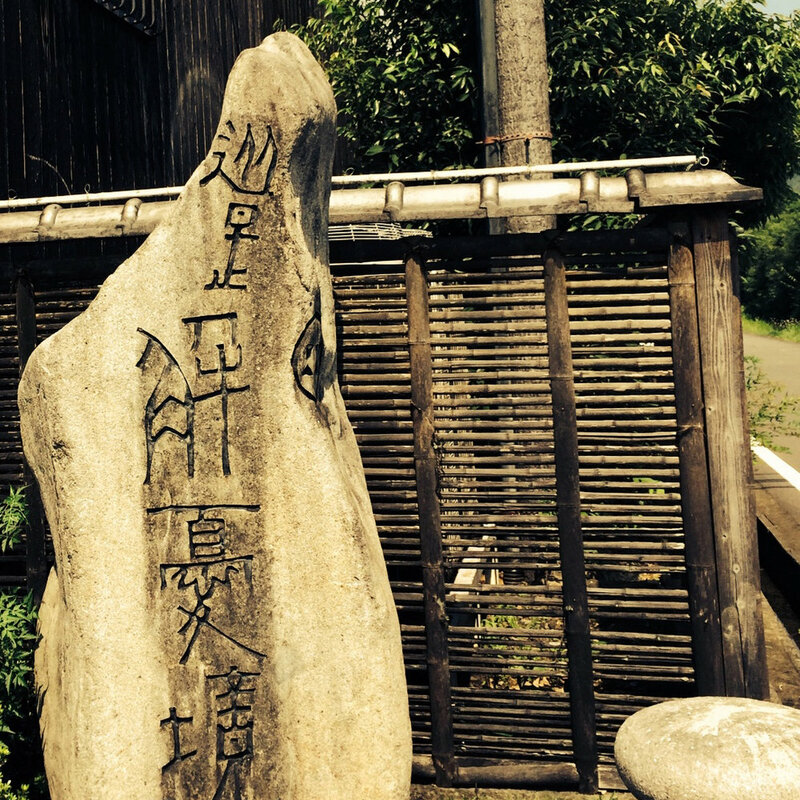 Its tradition is to use the pristine, soft-water of wells fed from the same aquifers which give life to the Takeda River. On site wells insure that theirs is a saké of purity, power, and elegance. Nishiyama wishes to share saké, an “honorable” apsect of Japanese culture, with the world, and is committed to protecting their regionality by using only water from their own wells, locally grown rice, the majority of which hails from estate paddies, using rare, organically cultivated, heirloom rice like Tajima Goriki & Hyogo-kitanishiki. Also rather unique is their almost exclusive use of Ogawa #10 yeast strain. 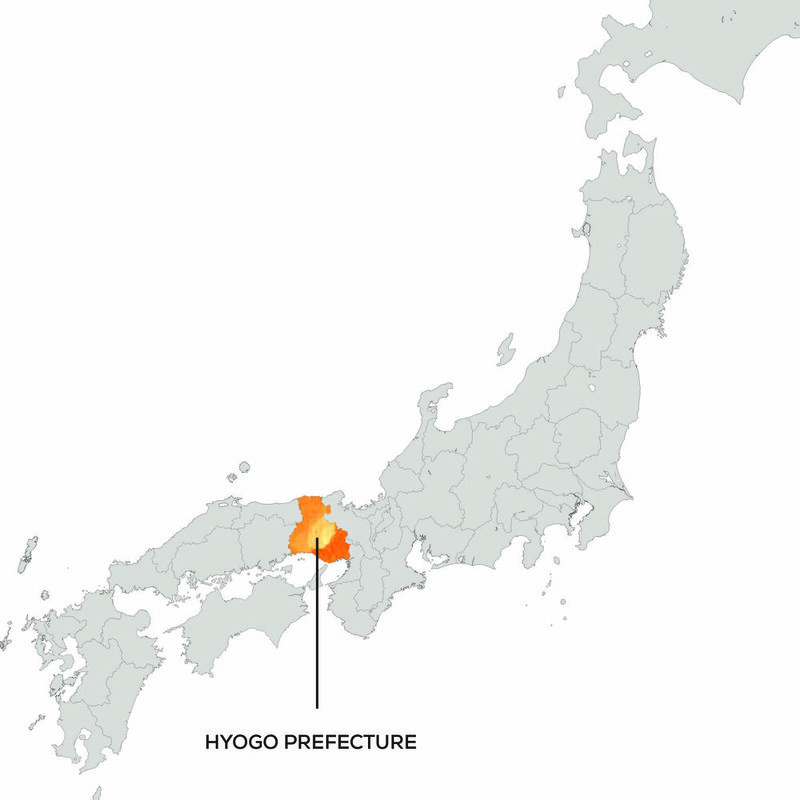 Additionally, they limit production to that which is sustainable, thus protecting their resources, heritage, and the outstanding quality of Kotsuzumi Saké. Ours is a traditional business, yet we have persevered for nearly two centuries by being able to change with the times, whilst protecting our heritage.Protecting and “not changing” are incongruent with our goal to provide saké lovers with a saké that reflect our traditions while embracing progress, leaving them to comment, “This is totally new!”. Hakuun Nishiyama was the third generation of the family to helm the shuzo and a haiku poet. In the early years of the 20th century he immersed himself in the stimulating world of Meiji Era haiku, associating with renown poets Hakutsuki and Kyoshi. After enjoying some of Nishiyama’s saké in 1915, Kyoshi penned and read this haiku, whose beauty is lost in translation, aloud at the shuzo, thus giving a name to what he assuredly felt was an exceptional beverage. Originally an ambassador, Watanuki followed his creative leanings and established his concept of Muhoan Seikai, or Fantasy World, which is reflected in his designs that adorn Kotsuzumi bottles. Taking Kotsuzumi’s stylistic grace and power to another level. “Aoi” exudes richness with the powerfully elegant, yet delicately whispering sweetness of glycerol that gently recedes to sapid dryness, leaving thepalate ready for either another sip or the next bite of food. “Tohka” has a comfortable sweetness derived from the rice umami with an all enveloping, viscous berry and fennel notes that skirt ethereal enchantment. Its mellowness highlights the flavors of fab food or salubrioussipping just because one can. Well-rounded and powerful. “Kurobotan” not only goes well with raw fish dishes but also pairs nicely with lightly grilled meat dishes due to its glycerol edge tethered to a refreshing sharpness that carries its heft dashingly alongside a wide variety beautifully prepared cuisine. “Hanafubuki” is the go to house cuveé and it showcases Kotsuzumi’s roundness coupled to its ever present poise. Thoroughly enjoyable with sashimi, sushi or as a stand alone sipper. Try it cool, lukewarm, or hot, because as they say in Japan, it has “gutsu”! 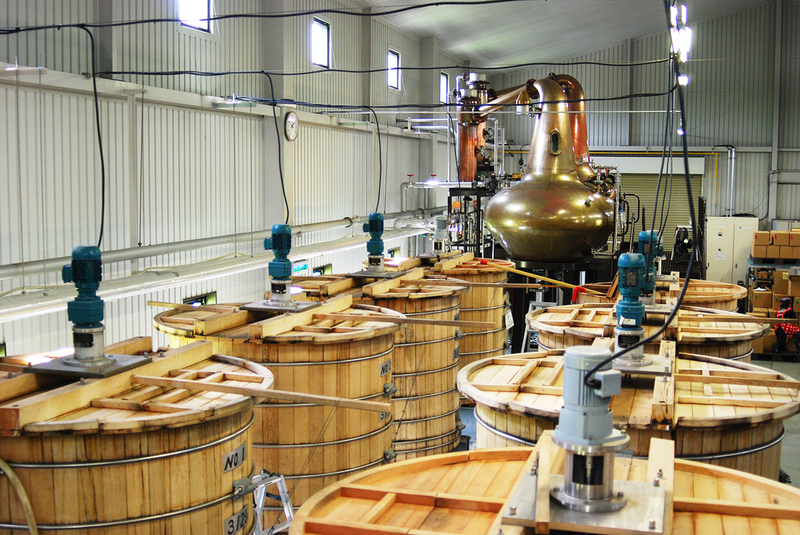 Kyoto Distillery is Japan’s first dedicated artisanal gin distillery and ONLY distillery in Kyoto. Located in the southern part of the city, the distillery sources their water from the famed Fushimi region which is tremendously respected for their delicate and delicious brewing water. 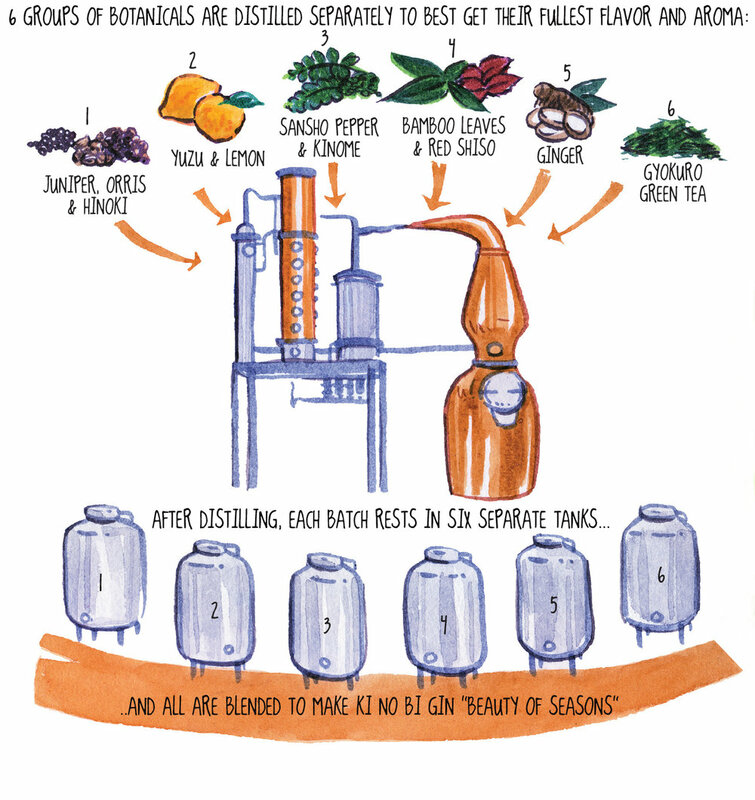 The aim is simple: to produce the best dry gin, utilizing local botanicals wherever possible. Every element of the final product should be completely authentic, from the local FRESH sourcing of the ingredients through to the design and craftsmanship of the packaging. 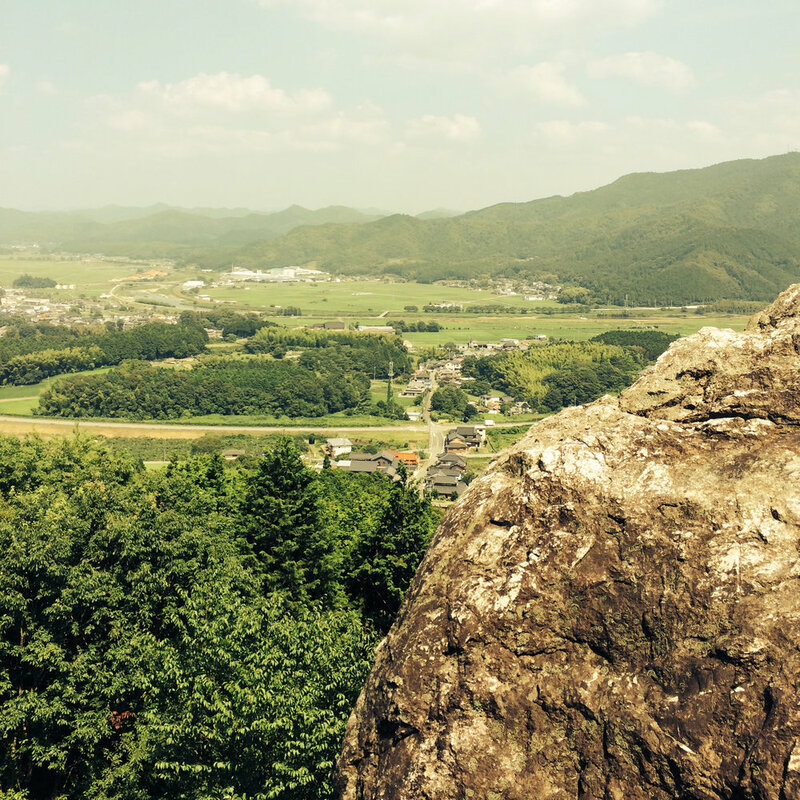 KI NO BI (The Beauty of the Seasons) is inspired by tradition and is distilled, blended and bottle in Kyoto. This gin is made in a recognizable dry style, but with a distinct Japanese accent. KI NO BI Kyoto Dry Gin is created with FRESH Japanese botanicals such as yellow Yuzu, Kinoki (Japanese cypress), Bamboo, Gyokuro Green Tea, Shiso and Green Sansho (Japanese Szechuan Peppercorn). Bottled at 45.7% ABV and with a rice base spirit, Kyoto Distillery has mastered not only the science of distillation but also the age-old art of blending, and separates the botanicals into six different categories: base, citrus, tea, herbal, spice, and floral. Each category is distilled individually, then blended in perfect balance to create the distinct KI NO BI flavor. TASTING NOTES: A fresh aroma of Yuzu and a thread of Sansho that lingers like a morning mist in a bamboo forest. The juniper complements and showcases the FRESH Japanese botanicals. A tingling sensation mid-palate from the Sansho leads to a slightly warming, spicy finish from the Ginger. Juniper, Oris, Hinoki are used for the botanical which is the base of the beauty of the season. It occupies half of the whole and forms a skeleton of taste. We use Yuzu known as citrus unique to Japan, expressing the unique character unique to "Seasonal beauty" not found in other gin. Arima, which releases aromatic fragrance in Oriental, shows its presence firmly in top note and after, tightens flavor. Bamboo and Red Shiso add fruity and floral essence to the whole. Although it is inconspicuous, it is unsatisfactory unless it is on the spot, it is such a name like a supporting character. While the pepper works against aroma, ginger tightens the flavor. Juicy and hot spicy feel at the moment you bring it to your mouth make your taste even more complicated. The gyokuro of a long-established tea room in Kyoto is also used. It gives a fragrance that is like Japan and a faint sweetness and brings all botanicals together in an elegant manner.